Just thinking about having to find files on a Macintosh fills me with dread. Spotlight is useless for finding anything unless you know where it is already. I am in the half of the Venn diagram labelled believes names of files and folders have meaning. In the other half are the interface designers of Apple’s Spotlight technology. 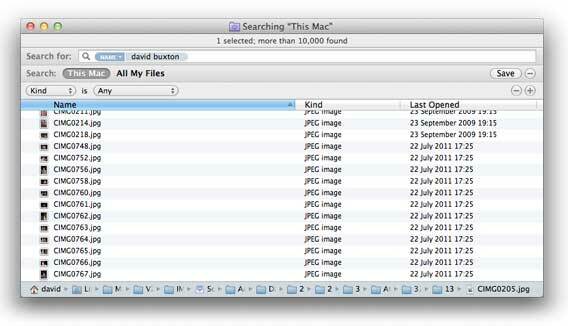 Here’s a plum example of how a Spotlight window in Mac OS X 10.5.3 does an alphabetic sort-by-name of results when searching for files using File Name criteria. I hate Spotlight. Makes me wonder what the point of all that amazing search engine technology is. This entry was posted in Blog and tagged broken, mac, spotlight on 10 June, 2008 by david.